Connected Industry Building Blocks (left-hand side of the vendor map): suppliers of building blocks that are used to create Connected Industry solutions. 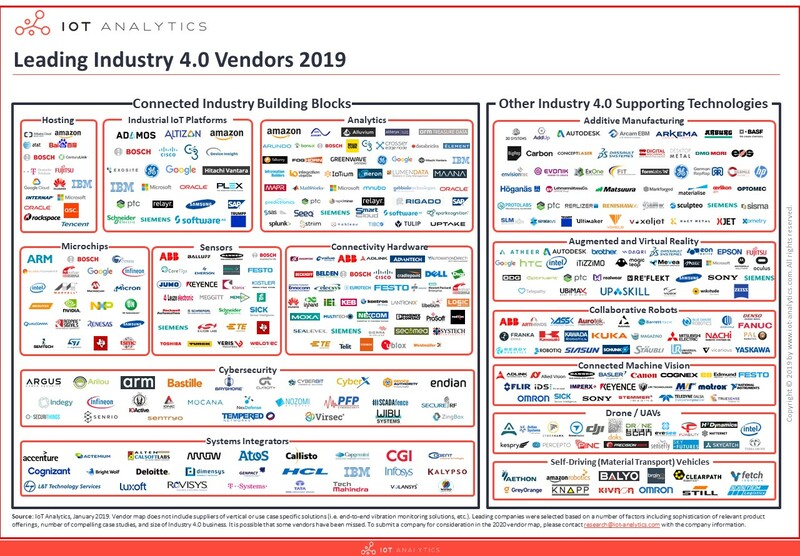 Other Industry 4.0 Supporting Technologies (right-hand side of the vendor map): suppliers of other technologies which can be deployed independently or alongside Connected Industry Building Blocks in order to realize Industry 4.0 use cases. Building on its long history of supporting industrial automation companies, Microsoft has emerged as the hosting partner of choice for many Industry 4.0 companies. Both end users (manufacturing facilities) and suppliers (OEMs, industrial automation companies, etc.) have partnered with Microsoft to develop and run mission-critical on-premise SCADA and MES applications for decades. Microsoft’s deep domain knowledge and technical capabilities (especially with respect to hybrid cloud solutions) have helped it become a leading provider of hosting services for major manufacturing end users and suppliers such as Siemens, PTC, GE, and Emerson. Industrial IoT platforms that are tightly coupled with infrastructure (IaaS + PaaS platforms). These IoT platforms that are tightly coupled with a cloud provider’s IaaS backend. Microsoft has emerged as the clear leader in this space with respect to Industrial IoT offerings, with Amazon, IBM, and Google also providing IaaS + PaaS platform offerings for industrial companies. Infrastructure agnostic industrial IoT platforms. These IoT platforms include many of the components of the IoT platform stack but are intentionally vendor-agnostic when it comes to the IaaS / cloud backend layer. Industrial automation companies like Siemens, GE, and PTC are leading the way in this category, which provides more flexibility for hosting in multi-cloud environments and on-premise. The much-hyped US-based industrial analytics start-up Uptake started off 2018 with momentum from a November 2017 investment of $117M that valued the company at $2.3B. In April 2018, Uptake acquired Asset Performance Technologies (APT), a SaaS company that provides failure mode information for 800+ industrial asset types. Uptake planned on using the APT database to enhance its predictive maintenance solutions and accelerate its growth, but by the end of 2018, the growth had yet to materialize. In fact (according to LinkedIn) Uptake’s total employee count (as of December 2018) had fallen to ~550 employees from its January 2018 high of ~800 (-25% YOY). Adding insult to injury, General Electric filed a lawsuit against Uptake in December 2018, claiming Uptake engaged in a “ruthless scheme to poach” GE executives who “will inevitably disclose GE’s trade secret information”. Despite its recent struggles, Uptake has secured a number of name-brand customers (including Rolls-Royce and Caterpillar). Uptake’s veteran (if not callused) leadership team of former GE executives will look to turn Uptake around in 2019 and avoid following in GE’s footsteps. Nvidia has emerged as the clear leader in AI training hardware and software among the chipmakers due in large part to its investment in its CUDA Deep Neural Network software library (cuDNN). This software library provides superior AI training performance for Nvidia GPUs, and it is particularly relevant for Industry 4.0 companies with offerings in collaborative robots, drones / UAVs, and connected machine vision. One example of Nvidia’s market presence can be seen in the connected machine vision market: the Cognex ViDi system (discussed later in this article) lists “CUDA enabled NVIDIA GPUs” as one of the recommended hardware requirements for its machine learning software used for factory machine vision applications. Festo is a German supplier of electrical, pneumatic, and drive control technology serving customers in both process and discrete industries all over the world. Festo is one of the leading Industry 4.0 companies due in part to its active participation in a number of Industry 4.0 working groups and focus on developing communication standards (OPC-UA, RAMI, AutomationML, etc.) that insure vendor interoperability. A number of products from Festo (such as the YXMx handling system and the Festo Motion Terminal, among others) include the CODESYS runtime control system which enables direct connectivity to multiple industrial IoT platforms in accordance with the VDMA 24582 standard. Since its acquisition of eWON in 2016, HMS has become a leading Industry 4.0 company specializing in industrial IoT connectivity. Originally designed as a remote access solution for controls engineers and OEMs seeking to remotely monitor and program PLCs, eWON’s product line has evolved into a suite of industrial connectivity. The eWON Flexy 205’s unique combination of remote connectivity, industrial protocol conversion, and industrial IoT platform integration make it a powerful and flexible tool that can be used for number of different tasks including remote PLC programming and/or remote condition monitoring via a 3rd party industrial IoT platforms like Microsoft Azure, GE Predix, and Siemens MindSphere. A number of industrial cybersecurity start-ups have popped up over the past ~5 years, however few have garnered as much attention from as many highly strategic investors as Claroty. With investments from Schneider Electric, Siemens, and Rockwell Automation, Claroty has created a diverse cast of highly strategic investors that should help Claroty grow its business. Claroty’s suite of industrial remote access and threat detection solutions help mitigate the ever-increasing cost and risk of industrial cyberattacks as more and more valuable industrial assets are connected to IP-based networks. A leading thought-leader on digital transformation and creator of the phrase “Industry X.0”, Accenture has established itself as a leading Industry 4.0 strategy and implementation consulting firm. The acquisition of Cimation in 2015 gave Accenture a strong foothold in IIoT within the process industries, and it has formed strong partnerships with a number of the large industrial automation vendors (such as Schneider Electric and Siemens). General Electric’s “GE Additive” division has made a number of noteworthy acquisitions and investments in industrial additive manufacturing companies. Acquisitions of note include Arcam (a leading provider of Electron Beam Melting technology) and Concept Laser (a leading provider of metal laser melting technologies). GE has also invested in Xometry, a marketplace that connects contract manufacturers (many of which have 3D printers) with customers needing low volumes of manufactured parts. Upskill is an augmented reality start-up that helps manufacturers improve operations. According to Upskill, their customers (which includes companies like Boeing, GE, Jabil, and Toyota) see an average worker performance improvement of 32% after implementing Upskill’s Skylight platform. Upskill is venture-backed by the likes of Cisco and Accenture and is well-positioned to leverage AR/VR technologies to help manufacturers improve operations. Industrial automation and robotics giant ABB is one of the largest companies to offer a line of collaborative robots. The Yumi product-line, which includes both single and dual arm collaborative robots, offers potential customers a lower cost and more flexible alternative to ABB’s traditional line of industrial robots. Building on its strong existing robotics business and recent acquisition of discrete industrial automation supplier B&R, ABB is well-positioned to take advantage of the growing demand for collaborate robots as manufacturers look for more flexible and affordable ways to automate production processes. Established in 1981 and widely regarded as the industry leader in machine vision solutions, the Cognex product line includes a wide variety of machine vision hardware and software solutions. Cognex’s VisionPro ViDi is a deep learning based image analysis software package designed specifically for factories. Machine vision systems will continue to grow in importance as manufacturers look to achieve higher quality yields and more flexible production, and Cognex stands to capture this growth and build on its already impressive customer base (which includes companies like Apple, BMW, and Thyssenkrupp). PINC is a leading provider of yard and inventory management solutions that use drones to help automate the labor-intensive process of inventory checks. The PINC AIR (Aerial Inventory Robots) solution combines drone, RFID, and barcode scanning technologies to help companies improve the operational effectiveness and efficiency of warehouse inventory cycle counts. Founded in 2009, Clearpath Robotics is a Canadian company that provides self-driving vehicle technology and services. OTTO Motors, a division within Clearpath Robotics, provides a number of self-driving vehicles specifically designed for inventory transportation in manufacturing facilities. Manufacturers will gradually move away from traditional fixed-path inventory transport systems in favor of more flexible self-driving systems, and Clearpath Robotics (via its OTTO Motors division) is well-positioned to take advantage of this trend. Are you an Industry 4.0 company that would like to be included in our list of companies? 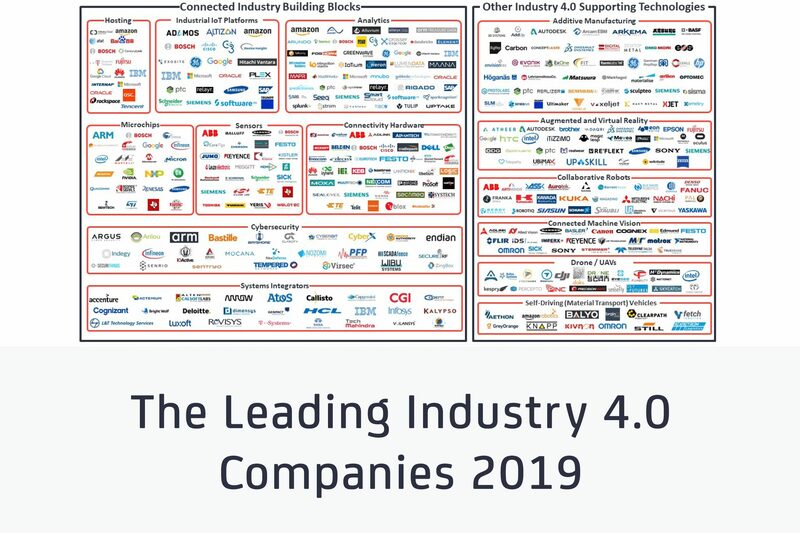 The Industry 4.0 Vendor Map 2019 was developed from a database of 375+ Industry 4.0 companies that is included in the enterprise license of our Industry 4.0 & Smart Manufacturing Market Report. The “leading companies” were selected based on a number of factors including product offerings, market traction, case studies, and company size, but inevitably we missed a few of the leading players. If you think we missed a notable company, please contact us with the company information and related offering and we will look into updating our database and vendor map. Are you interested in learning more about the market, trends, and technologies shaping the 4th industrial revolution? To learn more about the companies offering Industry 4.0 solutions and the Industry 4.0 market in general (e.g., How big is the Industry 4.0 market and how fast is it growing? How are leading manufacturers leveraging I4.0 technologies to win market share and improve operations? What industries are at risk of being disrupted by I4.0 technologies? etc.) check out the Industry 4.0 and Smart Manufacturing 2018-2023 report. This report, published in November 2018, offers more in-depth insights on the Industry 4.0 market (375 pages). Are you interested in continued IoT coverage and updates? Subscribe to our newsletter and follow us on LinkedIn and Twitter to stay up-to-date on the latest trends shaping the IoT markets. For complete enterprise IoT coverage (Enterprise subscription) with access to all of IoT Analytics’ paid content & reports including dedicated analyst time, contact us now and tell us what you are specifically interested in.